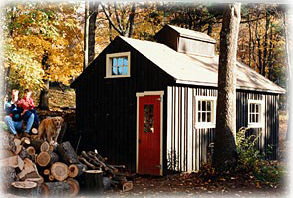 Maple sugaring has been in our families for over five generations, with its origins in Vermont and Quebec, Canada. Our Maple Kettle Korn story begins with construction of our Maple Sugarhouse in the fall of 1992. We purchased a used 2'x6' evaporator and buckets at auction and set our 300 taps the following spring. The following years our operation grew to 700 taps and a new 2-1/2'x8' evaporator with forced draft. It did not take long for us to develop a reputation for great tasting syrup. We even supplied our relatives in Vermont and Canada with our syrup. We soon developed our own Maple Products such as Maple Sugar, Maple Jelly, Maple Cream, Maple Candy and even our own Maple Vinegar from scratch. One fall day, while attending a local festival with our maple products, we observed a retired couple making kettle popcorn. The interest in their concession was considerable. We immediately imagined ourselves making kettle popcorn using our own maple sugar as the flavoring! That following winter, we introduced our Maple Kettle Korn at the ESPN 2000 Winter X Games at Mount Snow, Vermont. The response to our popcorn was overwhelming.We have since featured our Maple Kettle Korn at several major fairs and festivals. Our Maple Kettle Korn is preferred 10 to 1 over the original recipe kettlekorn which uses only white sugar. Our maple sugar gives Maple Kettle Korn a natural golden color and distinctive maple flavor that is superior to kettle korn sweetened with just white sugar. We're proud to be the First and Original Kettle Korn producer to feature all natural maple sugar. Follow the link for more information about our Maple Kettle Korn. With so many people asking us how they could get some more of our Maple Kettle Korn, we decided to go on the web and offer our product year round. 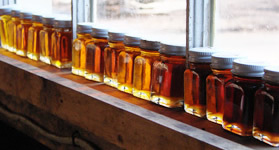 Bottles of maple syrup showing different grades of syrup. You can order our delicious unique Maple Kettle Korn by mail. For more info on ordering click here or for credit card purchases use button below.